Part1: 1945 - 1979 The discipline of architecture Ideology and methodology in a planned economy. Architects and the social sciences. Petrified typologies. Office design and organizations. Buildings that never lie. Systems thinking. Burolandschaft 58-78. Part 2: 1979-1991 The practice of architecture. The profession in the marketplace. Office buildings and society. Organizations, buildings and information technology. Changing role of the architect. Responding to change. A case for more collaboration. Architectural practice. The professional in the built environment. 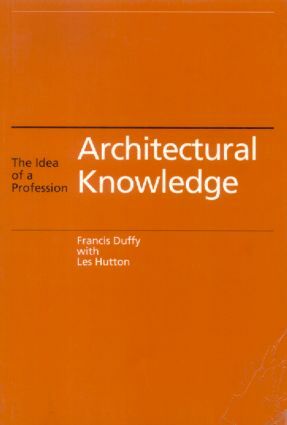 Part3: 1992 - 1997 The profession of architecture. Partnership in an intelligent market. Knowledge - defining the professional. Fighting deregulation. Keeping faith with our professional concerns. Liberalizing professional services. The way forward. Index.